"So the reason why we stopped at Dong Hoi is the nearby caves at the Phong Nha-Khe Bang National Park. We opted against staying in the $35 a night farm stay near the caves(which after reading a few blogs isn't actually a farm and is just a hotel near some farmland) and just decided to hire a motorbike and ride ourselves there. We headed north along the Ho Chi Minh trail and the scenery was beautiful, endless paddy fields, farmers herding their buffalo, streams and rivers stretching out towards the limestone rock formations in the distance. The first cave we stopped at was Phong Nha Cave. The cave was shaped by the Chay River and is only accessed by river so you have to hire a boat, to take you up stream, the 20 minute ride was very relaxing. The boat then enters the cave and takes you approximately 1.5km into the cave and there are points where you can get off the boat and explore the stalagmites and stalactites which they have kindly illuminated for your viewing pleasure. The cave is about 44km of grottos but the public can only see the first 1.5km. The cave is also closed between October to December because the river totally fills the cave - scary. It was quite spectacular". Phong Nha � Ke Bang National Park - is a national park in Quang Binh province in central Vietnam with an area of 885 km�. The National Park has the oldest karst mountains in Asia, which has formed about 400 million years ago. There are hundreds of caves, underground rivers and long underground passages with stalactites and stalagmites. In 2005 the park has been discovered a new species of gecko. 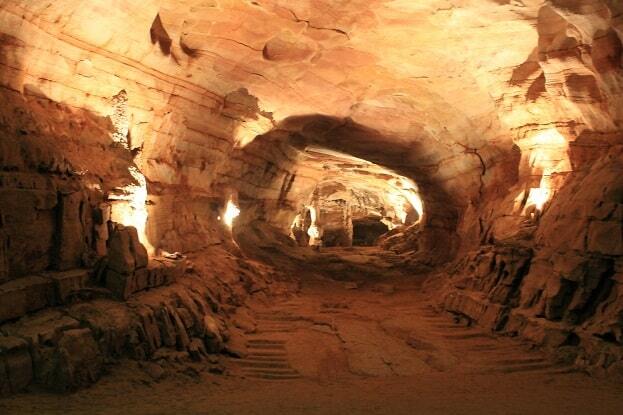 The park has about 300 caves and caverns with a total length of 70 km. British and Vietnamese scientists have examined 20 km. There are many underground rivers, streams and waterfalls in the park. Phong Nha - Ke Bang included on the UNESCO World Heritage List.Serious exploration of the caves began only in the 1990s when it first Cavers forced deep into Phong Nha Cave, one of the longest cave systems in the world. Paradise Cave was discovered in 2005, and in 2009 a team found the world's largest cave - the Son Doong. In 2015, the public was given access to two cave systems. Serious exploration of the caves began only in the 1990s when it first Cavers forced deep into Phong Nha Cave, one of the longest cave systems in the world. Paradise Cave was discovered in 2005, and in 2009 a team found the world's largest cave - the Son Doong. In 2015, the public was given access to two cave systems. Above ground, the park is a mountainous area with pristine, tropical, evergreen jungle. Phong Nha - Ke Bang National Park borders in Laos against the Hin Namno reserve. 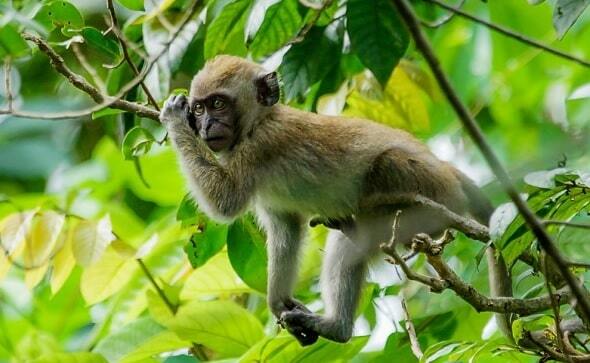 More than 100 species of mammals (including 10 species of primates, tigers, elephants, and the saola, a rare Asian antelope), 81 species of reptiles and amphibians and more than 300 species of birds live there in Phong Nha. Until a few years ago it the army decided that the Park was limited to visit. It was strictly controlled by the Vietnamese army. Access is still very strict, but with good reason, because the park is still littered with unexploded munitions. Officially it is not allowed to walk here without a guide. However, you can independently travel through the park (on a motorcycle or car) on the Ho Chi Minh Highway or Highway 20, which goes through the park. The region of Phong Nha is changing rapidly. Son Trach village (3000 inhabitants) is the main center, with an ATM, a growing range of accommodation and dining. Public transport is greatly improved with the other parts of Central Vietnam. 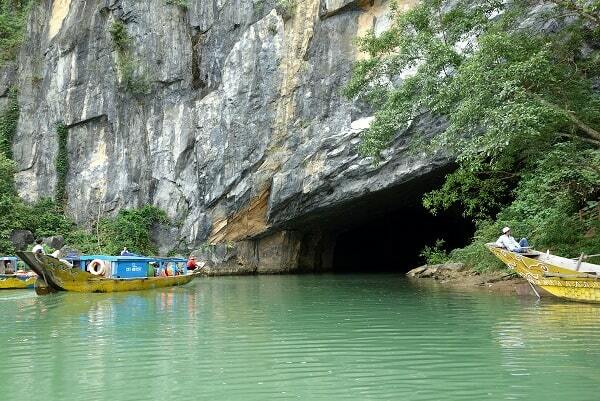 If you want to Phong Nha cave, this is only possible by boat, departing from Son Trach. It may be 14 people at once. The boats cruise upstream along buffalo, limestone peaks and spiers to gaping mouth of the cave. The engine is then switched off and the boats sail silently through the cave. You see the beautiful stalactites and stalagmites, which are illuminated by colored spotlights. On the return trip, there is an opportunity to climb the mountainside to Tien Son cave, where the remains are from Cham altars from the 9th century. The park is a 50 km� forest of the Calocedrus macrolepis (a conifer-like tree) on limestone. It is the largest forest of this tree in Vietnam. Most of the trees here are 500-600 years old. The ticket office and the departure of the scaffold in Son Trach village. The trip takes two hours to see Phong Nha; add to this an hour for Tien Son. In November and December there might be flooding and that means Phong Nha cave is closed. 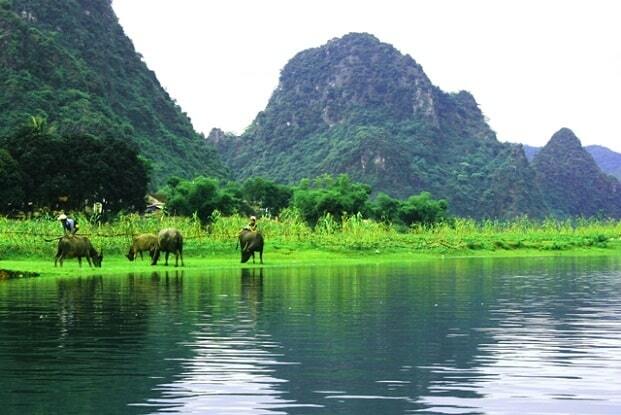 On the weekends it is very popular with Vietnamese visitors, whose presence is enhanced by the spectacular echoes. During the American War, the cave was used as a hospital and ammunition depot and was bombed heavily. .